We’ve learned of an interesting Bay Area office property listing that’s hit the market. The property, 2600@Tenth, is one of the largest institutional quality office properties in Berkeley, CA. It is being offered for sale by Wareham Development. Although a specific asking price was not given out, a local pro we spoke to heard they were asking about $52 mil. Located at Tenth and Parker Streets in West Berkeley, this is the second time 2600@Tenth has been placed on the open market for sale since it was completed in 1980. 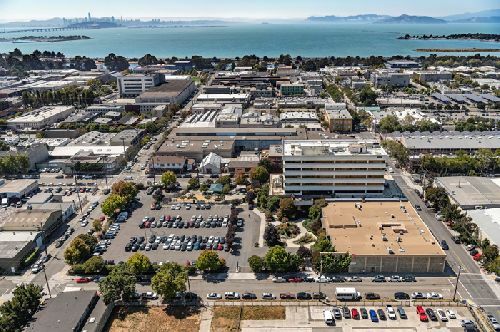 Wareham, a major developer and owner of life science, healthcare and technology campuses in the Bay Area with a multi-tenant portfolio of more than 4 msf, acquired the property in 2007 from the original developer and only previous owner, The Saul Zaentz Company. 2600@Tenth, which encompasses a full city block, consists of a seven-story office tower and two-story annex which together total approximately 125k sf. The upper floors of the seven-story tower have unobstructed 360-degree views of the East Bay Hills, San Francisco and the Golden Gate Bridge. 2600@Tenth is approximately 65% occupied by a mix of tenants in fields such as technology, architecture, life science and creative/media. The property, which sits on a 2.64-acre parcel, is said to offer investors with an opportunity to add significant value through leasing and/or renovating/repositioning. The property is less than two miles from downtown Berkeley and the UC Berkeley campus, and forms part of the Berkeley/Emeryville “Innovation Corridor,” a robust and growing cluster of life science and technology companies. 2600@Tenth is at an exceptional location for an urban campus environment. It sits within a highly walkable neighborhood close to housing, shopping and dining amenities such as Berkeley Bowl West, the Rare Barrel ale house, Fourth Street Berkeley, Far Leaves teahouse, and San Pablo Ave.
Michel Seifer, Rob Hielscher, Erik Hanson and Kristina Wollan have been awarded the listing from Wareham. An asking price was not given out.